If you have read Hilary Mantel’s Wolf Hall you’ll remember Ralph Sadler, the young lad taken into the household of Thomas Cromwell. Under Cromwell’s patronage, Sadler entered royal service in 1518, at the tender age of 11. Cromwell’s skills and efficiency in governmental matters – and especially in facilitating Henry VIII’s divorce from Catherine of Aragon – meant that he, Cromwell, rose fast in the king’s administration, and Ralph Sadler rose with him, eventually to become Principal Secretary of State to Henry VIII. The house that Ralph Sadler built as a rich and successful courtier still stands: a Tudor mansion tucked away in a busy corner of Hackney, a place described at the time as having ‘green fields and clean air’. After passing through many hands and serving many purposes in the past four and a half centuries, it’s owned and maintained now by the National Trust. We went to see it on a day of incessant rain last week. 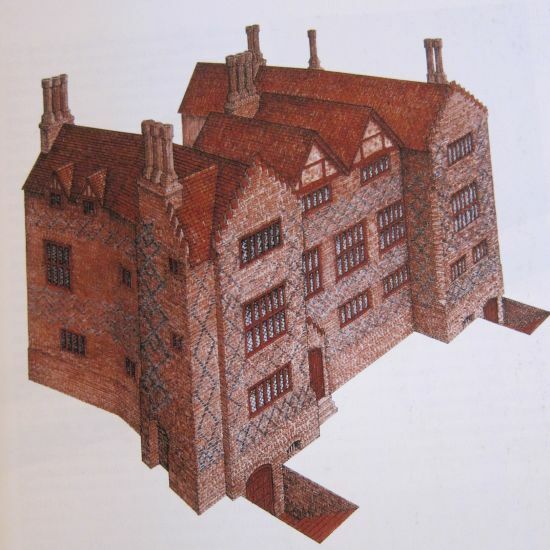 Now the oldest domestic building in East London, the house was erected in 1535 and was originally known as Bryk Place because, unusually for those times, it was built entirely of brick, rather than the more common construction from timber beams interlaced with wattle and daub. 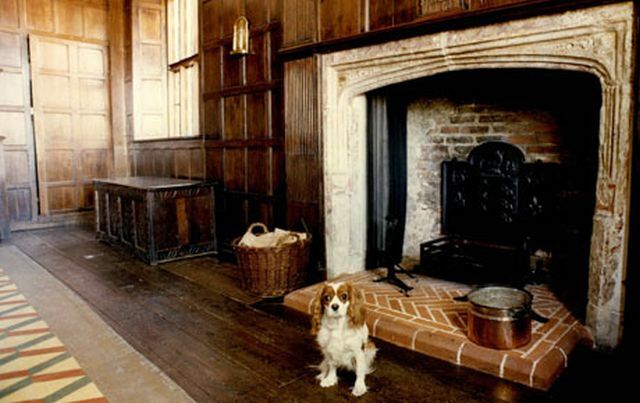 While writing Wolf Hall Hilary Mantel went to see Ralph Sadler’s house, and down in the cellar she came across original Tudor bricks, one of which she noticed bore the imprint of a dog’s paw. When the bricks were made and then laid out to dry, some unknown mutt had run across them. The sight moved her. As someone wrote: ‘Most of us would simply see a paw print; Mantel heard the dog, smelt it, felt its coat under her fingers, and watched as it loped away down a muddy country lane in Hackney’. I didn’t see any paw prints down in the cellar, and we both agreed that you had to work hard to feel a sense of the Tudor past, since the house has been pulled apart and shoved around many times since. It would be easier if you possessed Mantel’s imaginative powers. In the early 16th century Hackney was a prosperous village, less than three miles across open fields from Bishopsgate in the City. The centre of the village lay around Church Street (now Mare Street, where we left the 82 bus) with the medieval church of St Augustine at its heart. There were also a number of hamlets nearby, like Humberton (Homerton) and Clapton. 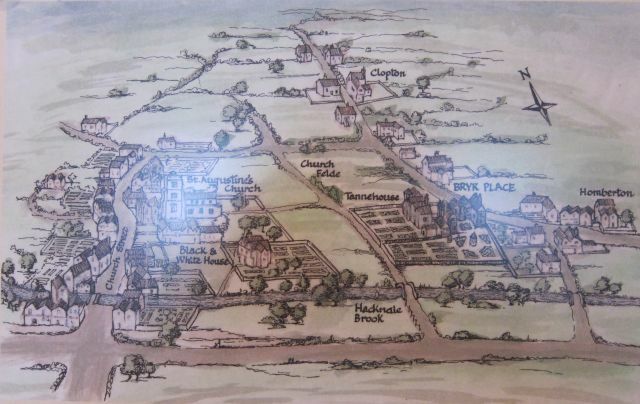 Between these various settlements were meadows and pastures, dotted with farms and market gardens that supplied London. Hackney was free of plague and close to the City and the court, so it was popular with noblemen and rich merchants for their principal homes, or country retreats. The house only acquired its current name in 1953, in the belief that it had been the house that Sir Thomas Sutton, the philanthropist and founder of Charterhouse School. This was in fact the house next door, which was demolished in 1805 to allow for the extension of Sutton Place, a Grade II listed terrace of Georgian houses that you walk down after crossing the churchyard gardens. The house has had many other names in its time, reflecting the fact that, down the years, it has been home to wool and silk merchants, Huguenots, schoolmasters, trade unionists and squatters. As Cromwell’s secretary Ralph was able and hardworking; a contemporary called him a ‘diligent and a trusty servant’ and by his own admission he was a workaholic accustomed to rising at four in the morning, impatient to start the day. By 1532 Henry VIII had noticed Ralph’s energy and talent and he was taken into the King’s service. Cromwell was by then the King’s chief minister. Soon Ralph himself is directly in Henry’s service and undertakes delicate diplomatic negotiations in France and Scotland and duties in connection with the dissolution of the monasteries. Increasingly prosperous, Sadler had Bryk Place built for his bride, Ellen Barre. 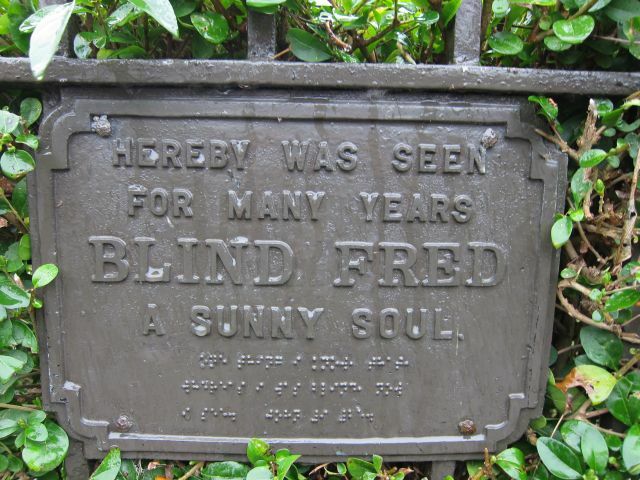 She was a servant and, she thought, a widow, but in a curious story that echoes old ballads, her first husband came back from the dead eleven years later, much to the couple’s dismay. Unbeknown to everyone, Matthew Barre had been alive somewhere abroad. Ralph and Ellen now had seven children, and Ralph was a wealthy and influential man at court whose reputation was at stake. Sadler was obliged to have his children legitimized by a private Act of Parliament which set aside Ellen’s marriage to Matthew Barre and made her marriage to Ralph Sadler a true and proper union. Sadler managed to prevent the publication of the Act and its details never appeared with the statutes of the period. In 1540, Sadler was knighted and appointed Principal Secretary of State, but later that year when his friend and mentor Thomas Cromwell fell, armed men arrived at Bryk Place to march Sadler to the Tower, where he spent several days accused of treason before being released. Sadler took a great risk in pleading for Cromwell’s life by writing a letter to Henry, the last three words of which read, ‘mercy,mercy,mercy’. Henry was apparently ‘much moved’ by the letter and asked Sadler to read it three times.However, Sadler’s intervention ultimately failed: within a month Cromwell had been executed by an inexperienced executioner using a blunt axe. Ralph Sadler was still working at the age of 79 as a member of the council that sentenced Mary Queen of Scots to death. He outlived everyone of his generation, and died the richest commoner in England. 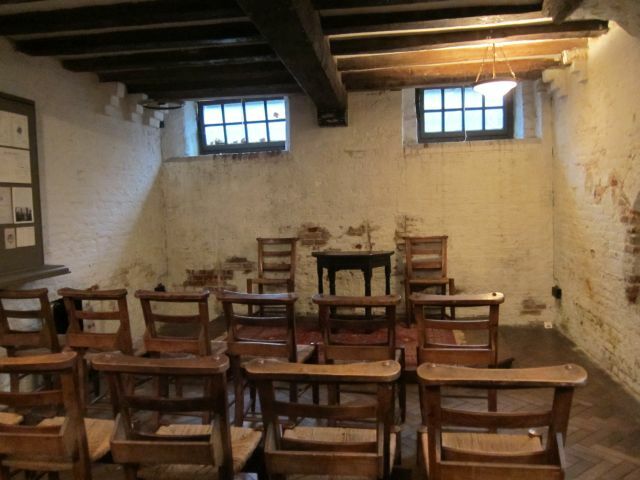 The first room you enter in Sadler’s former home is the Linenfold Parlour. 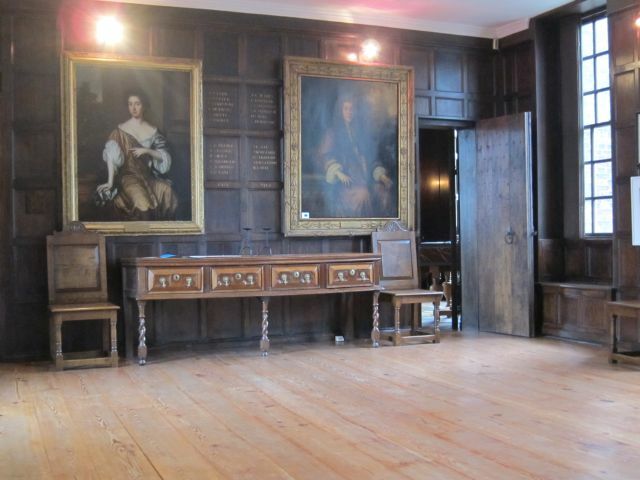 In Tudor times this room would probably have been used by Sadler for conducting his business. Given that he was a senior courtier, many secret conversations and delicate negotiations might have taken place here. The room is so named because the wall panels were carved to look like draped cloth. 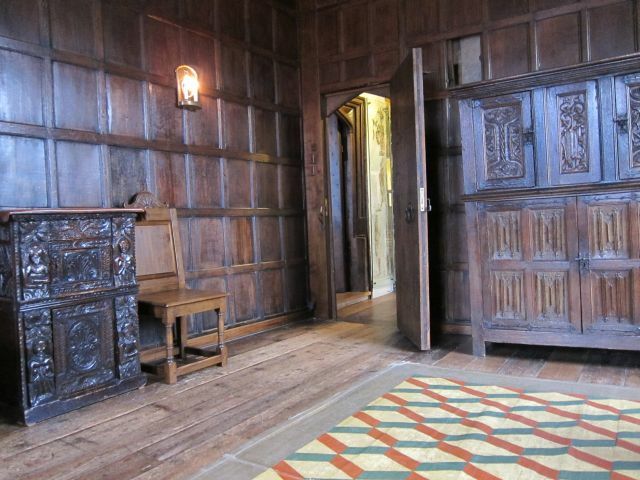 Wood panelling was popular in Tudor times, but it was a luxury item and expensive to make. When people moved house they took their panelling with them, along with the glass from their windows and wall hangings. When first installed the panelling would have been painted in bright colours. The next room is The Little Chamber, probably used by the lady ofthe house as a bedroom and also to entertain friends and educate her children. Ralph and Ellen had nine children, seven of whom – four girls and three boys – survived infancy. Ellen also had two girls from her former marriage. The original entrance to the Little Chamber was by a steep, narrow stairway leading up from the Linenfold Parlour below. In the early 17th century the owner of the house, Captain Milward, a wealthy silk merchant, blocked it up and cut a door through to his new painted staircase. 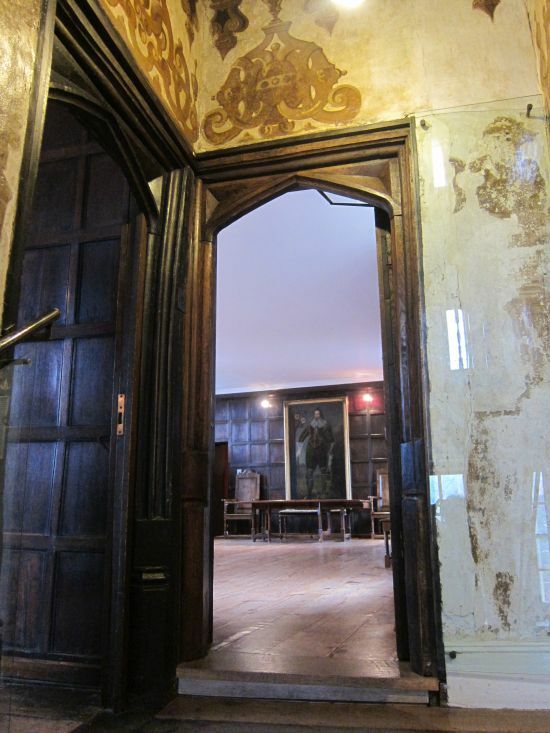 The oak panelling on three of the walls dates from the late 16th century and might have originally been painted red. It was Captain Milward, keen to show off his wealth, who commissioned the fluted panelling above and either side of the fireplace. He furnished the house with silk carpets brought from the Far East. Later, a collapse in silk prices in 1639, due to the increase in cotton production in America, resulted in the failure of his business and he had to sell Sutton House. The Great Chamber is an imposing room. In Tudor times banquets were held here, important guests would be invited upstairs to the Great Chamber, where they would be served with sweetmeats and other delicacies made from expensive, imported sugar. 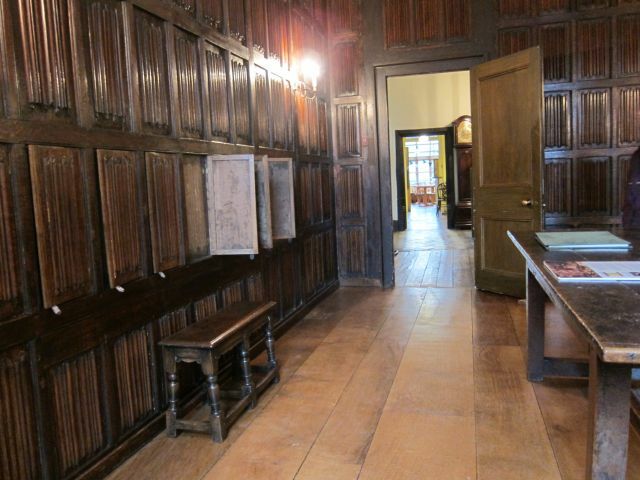 The oak panelling on the walls dates from around 161o. This was a costly feature and only used in the most important rooms. At the end of the room are paintings that date from the Stuart period. There’s s a single portrait of Sir Ralph Sadler of Standon, grandson of Ralph Sadler (glimpsed in the second photo below). On the opposite wall are two portraits – of Sir Edwin Sadler, another of Ralph’s descendants, and his wife, both painted in 1687. The Great Chamber served as an assembly room during the several periods when Sutton House was used as a school. The longest period when there was a school here was from 1657 to 1741, when the house accommodated Mrs Freeman’s girls’ school. More recently, when the house was owned by the St John’s Church Institute in the early 1900s, this was a billiard room. Sutton House: Great Chamber and portrait of Sir Ralph Sadler of Standon. Another room on the first floor, which may have served as Ralph Sadler’s bedroom, is now presented as a Victorian study. There’s a reminder of its time as a bedroom in the garderobe (lavatory) which is just off to one side. In the 16th century it was thought that if you hung your clothes over the toilet, you would rid them of moths and other annoyances – hence garderobe. 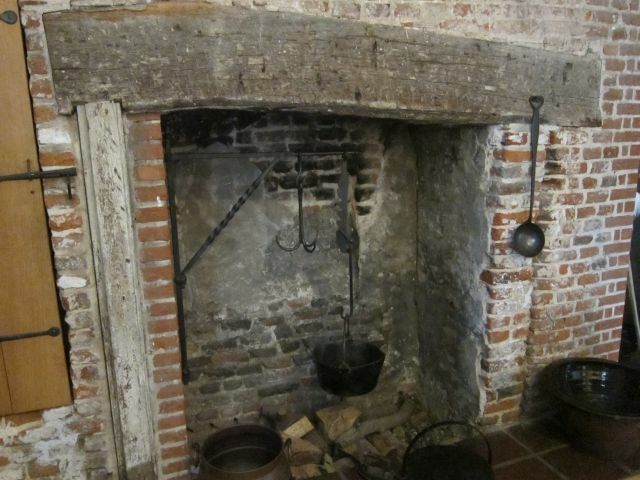 Back on the ground floor, there’s the original Tudor kitchen. Later, the kitchen was moved elsewhere and this room served a variety of other functions. 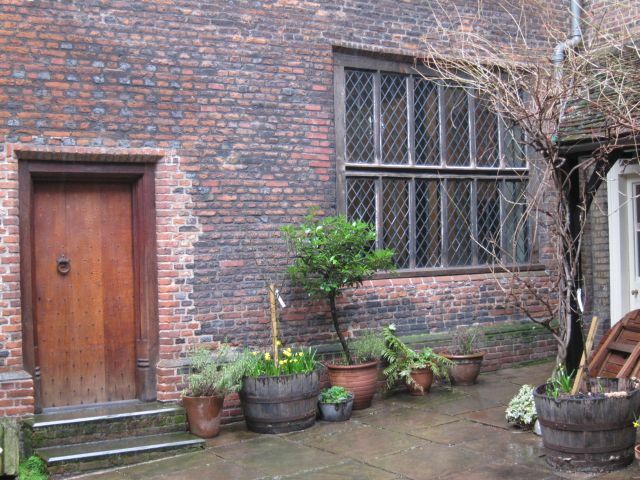 Down in the cellar you can see the the foundations of the house, with its original Tudor brickwork. Surprisingly, it was converted to a chapel in 1914 – from 1891 to 1939, Sutton House was home to the St John at Hackney Church Institute which aimed ‘to promote the spiritual, mental, social and physical welfare of young men’. The National Trust now present the room set out as if it were a chapel. By the time I first visited it early in 1987, this surviving fragment of the ancient hamlet of Hackney seemed to be at the end of its days. The makeshift sheds of a troublesome looking car mechanic were built right up against its west wall; the Georgian front was boarded up, and a passing vandal with a spray can had added humiliation to the injury of the peeling notice announcing that the building had come to the National Trust through the benevolence of one WA Robertson, who had made his gift in the memory of two brothers killed in the Great War. Recent repairs to upstairs windows and brickwork only added to the sense of dereliction; although carried out by the National Trust, they made Hackney DIY look positively refined. Inside, the story was far worse. The enclosed courtyard was full of junk. Damp and rot were creeping through the structure. Ancient fireplaces had been stolen or shattered and left lying around in pieces. The linenfold panelling had also disappeared. 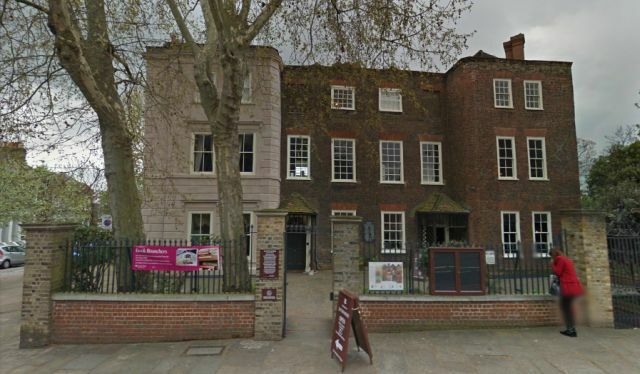 Thieves had ripped it out of the empty building a year or so earlier and sold it for £l per foot to the London Architectural Salvage and Supply Company in Shoreditch, the proprietors of which recognised its exceptional rarity and saw that it was returned to the National Trust. That was how Patrick Wright, journalist, author and sometime resident of Hackney, described Sutton House in his book, A Journey through Ruins in 1991. How had it got to that state? The house had been bought by the National Trust in 1938, leased first to St John’s Church Institute, and then from the 1960s it was rented by the ASTMS union, in the period when its general secretary was Clive Jenkins. When the union left in the early 1980s, the house fell into disrepair and for a time was home to squatters, who called it the Blue House. Eventually, in 1990, the National Trust started the restoration that has resulted in the building as it is today. 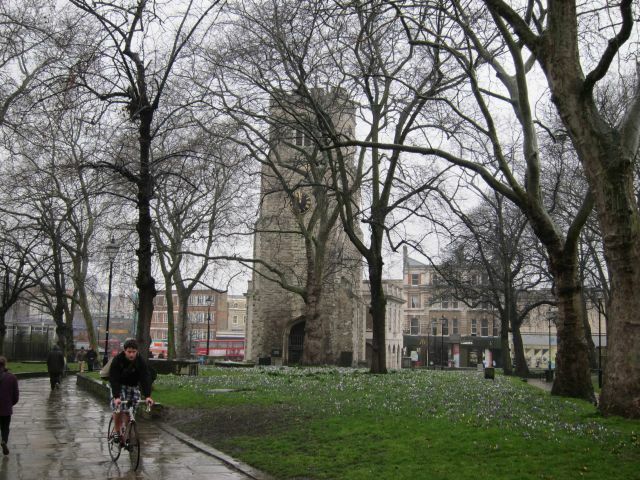 Leaving Sutton House, we walked back to the bus stop – the rain still pouring down – through St John at Hackney Churchyard Gardens, the site of Hackney’s old church of St Augustine’s that dates back to at least 1275. It’s been a burial ground for over 500 years and the medieval tower of the old church still stands there. Really great post – enjoyed reading it. I Believe Ralph Sadler was 80 years old at his death not 85. 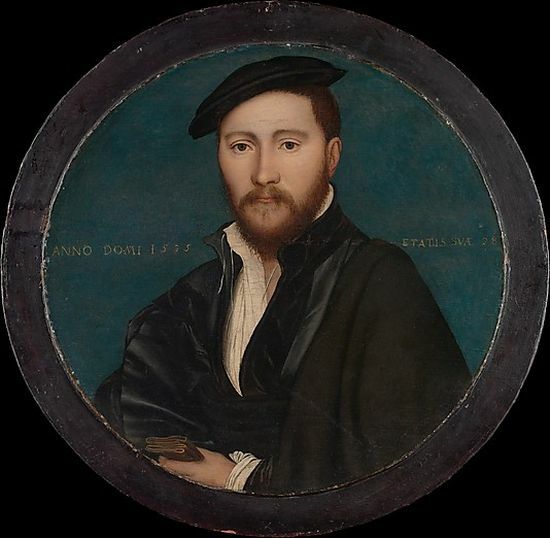 1507-1587. You’re right, Les; it’s my maths letting me down again! I’ve corrected the post. Thanks for pointing out the error! You also have to take in account that we don’t know the birth dates; he could have died before reaching his 80th birthday. Like Edward VI (who reached his sixteenth year on earth but not his sixteenth BIRTHDAY), Rafe could have been born in one month and died in another. You’re quite right that it takes a lot of imagination to bring the place to life – it’s partly what makes being a tour-guide there so fun! Cheers, Angus. Nice job- I hope your commentaries do not stray too far into the imaginative! Really interesting post, thanks -can’t wait to go and see the house when next in London. Have to point out though that the letter ending “mercy , mercy, mercy” which Henry asked Sadler to read 3 times to him, was actually written by Cromwell himself from the Tower, not by Sadler, according to Cromwell’s biographies. Thanks for the photos and history. Very well-written. Thanks, Mary. Glad you enjoyed the post.